Book Review: Three Amazing Things About You By Jill Mansell | An honest book review. Jill Mansell’s name on the cover sells books, particularly when the covers are attractive and promise what they give you ahead of the read; a curl-up-on-the-sofa-with-a-cup-of-tea-on-a-rainy-day sort of read. 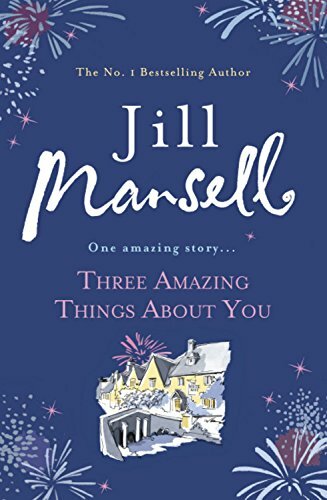 Regular readers of Jill Mansell know what to expect from one of the queens of Chick Lit writing, and ‘Three Amazing Things About You’ doesn’t disappoint. I had no hesitation in lifting this one off the shelf! Flo, Tanya and Hallie are the strong, warm-hearted female characters that readers can relate to; Rory, Luke and Zander are their caring love interests that all women would like in their lives. Surrounding them are a myriad of interesting characters, from aging, but outspoken Margot at Nairn House, the Retirement Home where Flo works, Zander’s spiteful sister Lena and Hallie’s best friend, big-hearted Bea, among others. The ‘Three Amazing Things About You’ of the title is a problem page website run by Hallie. Initially appearing just a hobby/past time that Hallie can run despite the limitations imposed by her disabling illness, threethingsaboutyou.com provides some of the humour in her quirky responses to the problems people write in about. It provides a depth to Hallie who could otherwise end up being defined by her illness; it provides a link between the characters that read the problem-solving site and finally brings them together at the end; and it also provides a thought-provoking backdrop to the ‘amazing things’ that unfold around and about them as the story progresses. The story-telling affectionately and with humour follows the three couples from the early blossoming of their relationships to a conclusion that will tug the heartstrings and have the intended audience reaching for their box of tissues – but the ending isn’t what you might initially try to predict! I must confess that despite my enjoyment of reading and the pleasure of anticipating an unread story, I do find starting a new book quite uncomfortable – familiarising myself with new characters, keeping tabs on who’s who and what’s what – particularly if I have just finished a resoundingly good read; however, from page one I couldn’t put this book down. It was, as I expected from Jill Mansell, a thoroughly good read!